Store, protect, and transport your DSLR, two to four lenses, a flash, and related accessories with the sage/khaki Discovery: Mini Photo/Tablet Daypack from Tenba. This versatile, 1.95 lb lightweight pack will accommodate an iPad, 11" MacBook Air, or 10" tablet in a separate rear padded compartment. The storage area on top is useful for stuffing a jacket, snacks, and other personal items. The bottom of the pack features touch-fastening padded dividers for organizing camera gear. For strength and durability, the pack is constructed from weather-resistant nylon with heavy-duty, self-healing zipper closure. A waterproof bottom panel and included rain cover provide additional protection. Carry the pack with the top handle, or wear with the padded, adjustable shoulder straps. A variety of interior and exterior pockets will hold your water bottles, valuables, and assorted accessories. Laptop Compartment Screen Size 11.0"
Box Dimensions (LxWxH) 18.0 x 10.5 x 9.0"
Discovery: Mini Photo/Tablet Daypack (Sage/Khaki) is rated 5.0 out of 5 by 6. Rated 5 out of 5 by Greg E. from Great photo bag This bag easily fits my Canon DSL camera and mounted lens (17-85 mm), separate flash and separate larger lens (EF 24-70mm). The storage area at the top of the bag is as described and could easily hold another lens or accessory. The iPad compartment is exactly the width of an ipad, so if you have any sort of bulky iPad case, you may have to remove the iPad from its case to fit in this compartment. It would easily hold any other smaller tablet or e-reader with or without a case. I love the bag for it's quality construction, ability to stand upright on its own, comfort, size and storage capacity. If you have large accessories, it may not be the bag for you, but if you have accessories similar to what I have described, it is great. Rated 5 out of 5 by David N. from Great daypack! This is my 2nd Tenba and is definitely not my last. After my first camera bag I expected a lot from Tenba and I was not disappointed. They are well made and very well thought out. I do a ton of walking and hiking during my travels and do not want to carry more then one bag, so I thought I would give a day pack a try. I looked a dozens of bags but none of them compared to the Tenba. I have tested this bag with my A77 II with a 24 to 70 and it does fit OK with a couple of accessories, but when I travel I leave that at home most of the time and breakout my RX-10 along with a flash, microphone, batteries, filters, and a tripod. This bag swallows them up with room for the rest of the days supplies. ie. snacks, water, sun screen, phone, wipes, and ibuprofen. What I feel needs to be said is this bag works well for what it was intended for. Do not expect this to be more. That is why I have three more camera bags. 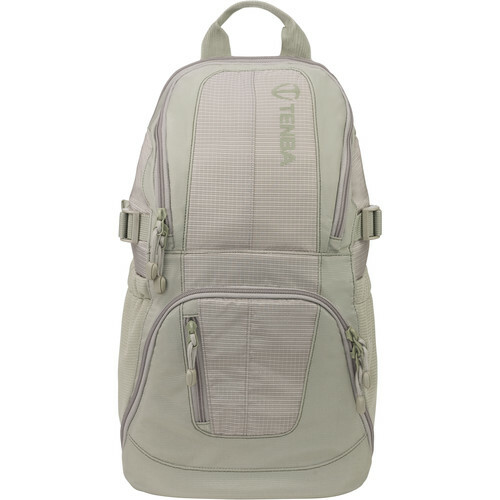 There will never be the perfect one size fits all bag, but from my experience Tenba is one of the better if not the best designed and constructed out there. Don't be tempted by a lower price, spend the extra and you won't regret it. Rated 5 out of 5 by D. Harris from This small bag has a lot of room. I really like this bag. It is small and comfortable yet holds all my gear. Here is what I carry in mine. In the bottom section: Sony RX10, Sony RX100, Sony HVL-F43M Flash, Sony HVL-F20M Flash, Three batteries for each camera, , the all weather cover for the backpack. In the top section (a.k.a. my junk drawer): Two external battery chargers, iphone charger & cord, two flashlights, pen, lenspen, remote control for cameras, batteries for flashlights and flashes, lens duster, bottle of Advil and there is still room for more. In the side pockets: a small tripod & a Jockery external charger for charging Phones etc. There is zippered compartment in front for a phone that I'm not using yet. One of my favorite features is how it stands on it's own and you can operate the zippers with one hand, very smooth. It's a nice looking bag and I highly recommend it. Rated 5 out of 5 by BillMFD3 from Great Bag - well made I wanted a bag that not only could hold/protect my camera and lenses but could also hold a days worth of stuff. Camera: Canon 70D Lens: Canon 135mm, Canon 60mm macro, Tamika 11-16mm wide angle Other: two batteries, charger, filters, lens cleaner Stuff (top zip section): pens, wallet, food, sweater Two side pockets: water bottle, small tripod Thats basically 99% of my camera stuff. Don't expect to buy any more lenses so this bag should last. Nice zippers and the exterior is made of some high quality nylon. The internal deviders are adjustable/removable ao you could even use this bag as a backpack. I dont have a tablet or ipad but the pocket for one seems well padded too. Id recommend this pack for someone with one camera, a couple of normal sized lenses and the need to cary a days worth of other stuff. For more than that Id go with the bigger bag. Rated 5 out of 5 by Mika from Very well made!!! This is a great bag for a day trip for shooting. The padding is thick to protect gears well. It looks small, but it takes one body and two or three lenses nicely. ( I use Sony A7 III) The color is not as light as I saw in the monitor, so I am kind of glad that I don't have to worry too much about getting dirty. I think Tenba discontinue this line, so you need to get soon if you want this one. Rated 5 out of 5 by Gabriela from Excellent backpack This is a great backpack, I have tried many and this is a winner: Light weight Fits a full frame with a 24-105mm One or 2 more lents or flash iPad Accessories, water bottle, wallet, phone, and has a raining cover wich works really well, already use it. I just wish it was black! Does this pack have a waist belt? No, this backpack will not have a waist belt. Does it come with the camel pack (water bladder) if so, how big????? The Discovery Medium Backpack fit a hydration bladder, but the Mini Daypack will not. can the top divider on tenba discovery mini be removed to make one large area without dividers? Just to clarify, if you remove the divider the whole camera compartment must come out. It then becomes just a regular backpack with no internal support.